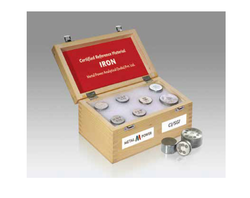 We are one of the accredited manufacturers and exporters of Certified Reference Materials. Under this category, we offer our clients a wide assortment of Certified Reference Materials. Cutting edge technologies and high quality raw material are widely used by the experts in manufacturing these machines in adherence with the industry standards. Further, clients can avail these machines from us in different sizes and technical specifications as per their needs. These are the Certified Reference Materials (CRMs) used to check standard quality and traceability of products. This CRMs is generally produced under the strict controls. They are sufficient for homogeneous and steel. We offer them at very low prices.